Yesterday it became a lot more REAL. 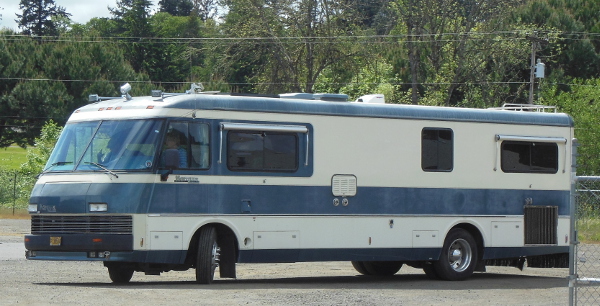 I actually drove our new (to us) RV. Actually, it wasn’t as hard as I thought it would be, although I did nearly take out part of our fence on the narrow section of our driveway. It still has the original tile (real tile!) countertops and kitchen floor, and oak cabinets throughout. Being nearly 30 years old, it needs some TLC and upgrades on the inside, but all of the engine and “house” systems seem to work fine. We’ve been playing with it today, seeing how everything works. Lots to learn. We plan to do some remodeling in order to get a good desk and workspace for each of us. New carpets and window treatments are probably also on the horizon, but we haven’t made any final decisions on what we want. I’ll post pictures as we go through the process. I am so excited for you. I am looking forward to all the updates and progress, and of course being on your North Carolina tour when you pass through! Thanks! We will plan on stopping by when we get to your neck of the woods. Want to see what you do with all those English Ivy plants! Ahhhh! I can see it now: the mobile soap doctor, offering a prescription for what ails your cosmetic concoctions…you could be the next generation of food truck. Can’t wait to see what you end up doing with the interior. Best of luck on your crazy, new adventures! Thanks! It’s kind of exciting. I think I’d rather be giving classes on labeling and/or doing label reviews than trying to doctor busted cosmetic formulations! !